The kids are over half way through their school year, so now is when I am actively looking for the materials that they will be using next term. Do we stay with the company we are currently using curriculum from or do we make changes? Here is the breakdown of what we have learned. I will start with Little Miss, then do Pookie’s curriculum. Little Miss has been using the Adventure’s program from My Father’s World (MFW). We chose this because is said to give a good foundation in U.S. History. We also were using Christian Light for the Language Arts and Math courses. The MFW program has a lot of reading and hands-on when compared to other curriculum. The problem lies in the fact that the written work is very minimal. This resulted in Little Miss not getting enough writing practice to help in spelling words, creative writing, or even journaling. Most writing is either a very short 2-3 sentences, copywork, or making a short notation on a timeline. This didn’t go over very well with us, so we ended up going to Mardel’s Christian Book store and buying both a handwriting workbook and a spelling course. We chose to get her Language Arts and Math from Christian Light. We learned previously that the suggested Singapore math course was not a good choice. Singapore skips along too quickly on key math foundational skills that does not provide enough practice of skills being learned. By switching to Christian Light, her math skills have improved. She is getting the practice needed and is learning more than she had with Singapore. The Language Arts program is also a very well presented course. She has been making much more progress than she was before. The reading schedules in MFW was disappointing. Little Miss loves to read and the 2-3 page reading assignments just frustrated her. She became discouraged to the point of not wanting to read the assigned pages at all. With MFW, there are no book reports. Either you write a few sentences about the day’s reading, or you talk about it. Little Miss began struggling with remembering what she read. She just wasn’t into it. So, I had to come up with ideas to help her remember what she was reading. I found a free printable brainstorming form online. It has a large oval in the center. Around this are several medium sized circles with lines connecting them to the large oval. For each circle, there are several smaller circles connected with lines as well. In the center, she wrote the topic of the reading assignment. In the medium circles, she wrote a fact or event about the main topic. The smaller circles were for supporting information. This helps her organize her thoughts better. The backbone of the MFW program was its history course with science and geography tied in. The main focus in History was the formation of our country and each state, as it entered into the Union. I was disappointed to see that the notebook pages for the states were simply coloring pages. There was a space for a sticker of the state flag in an upper corner. The informational part of the page was a reading on the back. This was way too simple. It seemed more like something a much younger grade level would have done. It would have been so much better to have the reading with a notebook page on which she could record state vital information, draw the flag herself, and maybe a blank map of the US for her to color in where that state is located. It was disappointing that many of the basic fundamentals were missing. So, again, I had to supplement with more appropriate materials. By the time I purchased supplemental materials for the curriculum, I spent nearly double on her curriculum than I should have. The added expense was something we had not budgeted for. In the end of the day, I can honestly say that we won’t be using MFW again. We have already chosen her curriculum for next term. I will be heading to a homeschool curriculum book store where I can look at the materials before making the final choice. Once the final decision is made, I will post about it sometime after convention. Pookie’s curriculum has been a constantly evolving process. He truly is a child that cannot be placed into a specific curriculum group. In many ways, he is still extremely delayed in his development. Yet, he is very quick to learn in some areas. Because he is so “all over the place” in his development and ability to retain information, I have to use multiple approaches with him. Pookie is using the Simply Classical curriculum from Memoria Press, the Letter of the Week program from Erika of the Confessions of a Homeschooler blog, and Montessori style activities. Each of these provides a specific need that he has in his academic and developmental growth. Simply Classical is written to fit a developmental age, not a grade level. It is presented in a way that can be used with special needs children who are severely delayed. The first level, Level A, is for children with a developmental age of 2-3 years. Pookie’s occupational therapist tested him and he is rated at being 25 months of age developmentally. With that in mind, the skills taught in Level A are a good match for him. I love that the program’s lesson planner includes a detailed list of the developmental skills taught in the program. I provided this list to his therapists at the therapy center and they are able to see at a glance what he will be working on. They are also able to include some of those developmental skill goals into his therapies. Pookie loves the lessons from this program. They include a lot of time snuggled up with a book with Momma as I read the books to him and he points to various objects in the illustrations. He is learning the early math basics as well as phonics. The Letter of the Week curriculum is fun. Erika did a great job putting this together. The lesson plans are very detailed and all worksheets are provided. You only have to print them out yourself. We use these worksheets as a method of not only reinforcing the lessons in the Simply Classical program, but also as a way to teach Pookie to work independently. I get him started, then am gradually fading back so that he is doing more and more without my aid. The Montessori style activities are probably one of the things Pookie looks forward to the most. I have sensory bins for him to play in, fine motor activities, and puzzles. We also do some crafts as well. These programs are going to be something we do for some time. As he gets further along, I will introduce more challenging materials, but this style of learning seems t fit him best at this time. I do not see us changing it too much. The only changes that I see ahead are buying the Level B program from Simply Classical and the Pre-K or Kindergarten program from Erika. The Montessori style activities will grow with him as well. One note of interest: to my knowledge, the Simply Classical program is the only curriculum available that is set up according to developmental ability or age. If there are other special needs curricula out there, I have not yet found them. Typically, a special education class will use preschool materials as a starting point. This program addresses a need prior to a child being able to use the skills necessary to do preschool work, which is comprised of a lot of coloring, cutting, and pasting. If you are looking for a fun way to get your kids to do journaling, here is a great option. 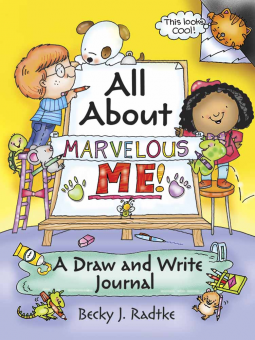 All About Marvelous Me is a 64-page book of fill in the blank pages that will inspire your kids’ creativity. Each page is a new topic to write about. Here is a summary from Amazon’s website. Kids can have fun reflecting on their past, present, and future! Loaded with fun things to do, such as fill-in-the-blanks, checklists, drawing, and journaling, this 64-page book will inspire children to write and illustrate details of their daily lives and inner thoughts. Activities include taking personality quizzes, designing the ultimate hangout, imagining the perfect job, and many other interesting personal challenges. This book is arranged in a fun format that even some of the most reluctant writers can find to be inspiring. I love that it is set up in such a way that children who have difficulty with written expression will be able to manage the journaling very well. Little Miss does not enjoy writing, yet this looks like a book she would have fun doing. Definitely, this is one journal that I will be adding to Little Miss’ workboxes. It isn’t very often that I have become excited enough about a product to review it on a blog but I have found one. My son has a lot of difficulty trying to hold a pencil or crayon. He cannot grip it properly and I end up having to gently hold his fingers into position while he writes or colors. He does the work, but I am simply helping him to keep the pencil or crayon in his hand. A few years ago, my husband was using a wishbone shaped pen by Pen Again. I thought it was strange looking but it was very comfortable to write with. Last year, I saw that they also made a mechanical pencil. I kept thinking that I should buy one, but I didn’t at the time because I hadn’t realized how much it would be needed. I found them again in a school supply catalog and ordered 2 packs of them. These come in a twin pack. I also purchased 2 of the packs of lead refills to keep on hand. I am so glad that I got these pencils! Pookie sat on my lap, his favorite spot when learning something new, and I placed the pencil in his hand. Surprisingly, he was very receptive to it. We got out his Pre-K workbook and turned to his assignment. He was tracing the numeral 1 on this particular page. I guided him through the first one, then let him start taking over. Although I had to support his arm, I did not have to support the pencil in his hand. A couple of times, I had to gently apply pressure on his finger that rests over the pencil to show him how to apply pressure to the lead. Once I did that, he was able to transfer the pencil markings to the paper. Seeing how well he is writing with these pencils, I am certain that his ability to write will improve. I love that these pencils, as well as their pens, make it easy for the child to place their fingers properly around the pencil. 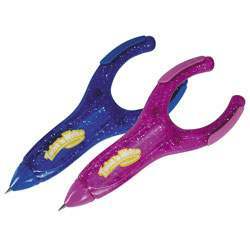 They do not have the problems with gripping the pencil so hard that they get cramping in their fingers. I will definitely be stocking up on these, along with the lead refills. I know that we will be getting a lot of use from them.